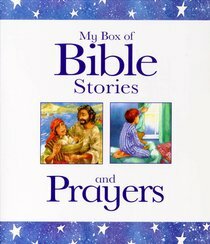 "My Book of Bible Stories" contains 37 Bible stories from the Old and Newestaments. "My Book of Prayers" contains over 100 prayers thematicallyrranged for ease of use. About "My Box of Bible Stories and Prayers"
Su Box has always loved books and had no hesitation in pursuing a career in publishing. She has many years' experience as an editor and author specialising in both children's and inspirational books. Su says she often gets ideas from children themselves and from a part of her that's "never really grown up". She lives close to the River Thames in the university city of Oxford, England, where her hobbies include reading and browsing in bookshops, music, fair-weather gardening, and relaxing with friends. When time permits she likes to travel abroad, preferably to somewhere new.